The real thing. 5 stars from Paul Pacult. Craft-method infusion using exotic true fruit from the fabulous rare-fruit orchards of John Kirkpatrick in the San Joaquin Valley. DSP CA 162 was the federal registration number of the original Germain-Robin distillery, up on Ansley Coale’s ranch (1982). That’s where Crispin Cain of Tamar Distillery learned how to distill, apprenticing with the great Hubert Germain-Robin. 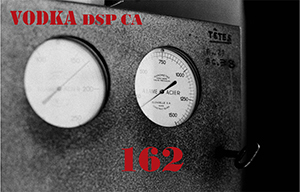 DSP CA 162 shows exactly what’s important about hands-on craft-method distillation: preserving the fresh taste and aroma of the fruit, deriving flavors and aromas that are clean & pure, distilling a smooth and lingering spirit. Nothing in the bottle but enjoyment. Zero roughness, zero rubbing-alcohol smell. DSP 162 makes great cocktails because you don’t need that ton of sugar used to conceal harsh alcohol. …about as far from commercial as you can get… captures the very best of what wheat and grapes bring to the equation in a vodka, and manages to present those flavors like they were designed from the start to go together….It’s hard to remember savoring and exploring a vodka as much. products that defy the flavored vodka category. The DSP 162 vodkas aren’t just flavored vodka, they are a presentation of the essence of things and represent an exciting new direction for the vodka category. View cart “DSP CA 162 Citrus Reticulata var. Sunshine (Tangerine)” has been added to your cart. Wine from premium (expensive!) Mendocino viognier grapes is batch-distilled to 28% alcohol on the Germain-Robin cognac still, then redistilled to the statutory 95% on a Holstein pot-still. This wine vodka is then blended into vodka distilled from wheat (wheat gives a round mouthfeel). The "Straight" is amazingly smooth, with absolutely none of that disagreeable rubbing-alcohol aroma. One 200ML bottle each of Straight, Buddha's Hand Citron, and Malaysian Lime, superb examples of craft-method work with real fruit. Craft-method infusion of real fruit: the Malaysian Lime, limau purut, and its leaves. The leaves – also used in Thai cuisine – bring a deep richness in the flavor. Craft-method infusion of real fruit: the exotic and beautifully fragrant Buddha’s Hand Citron. The Buddha's Hand is less acidic and is far more complex than lemons. Craft-method infusion of real fruit: fresh ripe Tangerines, with added complexity from their tasty cousin, the Tangelo. The aroma in the glass is as if you had started peeling a tangerine. Craft-method infusion of real fruit: cranberry with a subtle complexity from the Buddha's Hand infusion. Craft–method gin from the talented distiller Crispin Cain. Crispin infuses his gins with rare botanicals and with real fruit (Malaysian lime) and real spice (the rhizome of organic Hawaiian ginger), distilling on both a small Holstein potstill and the 16HL Germain-Robin antique cognac still. Folks ask: another gin? Well, Crispin and Ansley Coale thought there was a lot of room for improvement by using the finest craft methods. So did Paul Pacult: his Spirit Journal‘s 2013 list of the world’s 120 best spirits ranked Russell Henry as no. 11; the next best gin ranked 54. “A stellar example….new landmark in American gin-making. ★★★★★ Highest Recommendation”. One 200ML bottle each of London Dry, Hawai'ian Ginger, and Malaysian Lime, superb examples of craft-method work with real fruit. Soft, intense, long; the distinctive flavors and aromas of the London Dry have married into a superbly rich bouquet and a deep complexity. This is one of the finest, and most interesting spirits I have ever tasted. There is a 3-bottle limit. Extraordinarily appealing gin. Very smooth, very rich. The botanical mix is Crispin Cain's secret, but includes juniper, coriander, orris root, and lemon peel. The old cognac still lends its usual focused delicacy to the flavor. Craft-method infusion/distillation with the actual leaves and fruit of limau purut, a flavorful lime native to Malaysia. The fruit comes from the exotic-fruit orchards of John Kirkpatrick in the San Joaquin Valley. Craft-method infusion/distillation of genuine Hawaiian ginger grown by Phil and Linda Green, organic farmers on the north shore of Kauai. True ginger heat: the cocktails are unreal.